Eggplant chutney is a quick recipe . 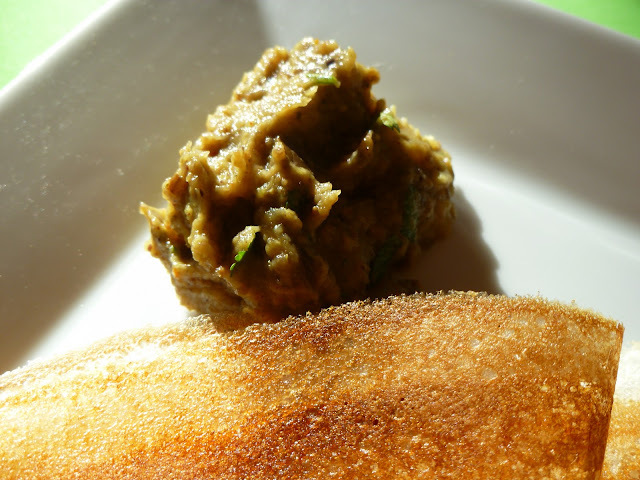 Nice variation to be served with dosa or adai when you don't want to make the coconut chutney. Heat oil and add the jeera, coriander and chili. When the coriander seeds change color , scoop out and set aside to cool. Add the turmeric , tamarind , garlic and eggplant to remaining oil. Cover and cook till the eggplant is cooked through. Grind the coriander , jeera and red chili well when cooled. Add the eggplant mixture and salt to the above mixture and pulse 2 -3 times. Garnish with coriander leaves and serve with dosa or rice and ghee. That is one yummy curry! helthy n flavorful chutney. . . .